All of Danny’s publications are presented on this website in an infinite loop allowing you to browse through the writings. They are not in a chronological order, but put related content together instead (a full list of Danny’s publications can be found in his CV). Where available, digital versions of the texts can be downloaded as PDF documents, or links to related websites are given. by Danny Dorling and Sally Tomlinson. Books on Brexit explaining how and why parts of Britain voted to leave the European Union are falling hot off the press. Some promise the full story of the political manoeuvring that got us to this point, others promise to make sense of the vote, with a couple focusing on the supposed evils of immigration and Islam. In Rule Britainnia, Danny Dorling and Sally Tomlinson tell a different story. They argue that the EU referendum was part of a last gasp of empire working its way out of the British psyche. It is a view of empire largely based on myth and nostalgia. Dorling and Tomlinson are not arguing for any particular position, but suggest that whatever the next year brings Britain will be much diminished by the process of trying to leave the EU, and that there is no welcoming Empire, Commonwealth, or other set of countries, ready to quickly embrace new trading relationships with us. They do, however, recognise the potential to reshape a post-Brexit Britain, assuming that the UK can accept a world order not based on the past. Inequality is the key political issue of our time. Danny Dorling wrote his seminal work Injustice: Why social inequality persists in 2010, and as an early proponent of rapidly reducing economic inequalities, he is now much sought-after as one of the foremost contributors to the debates surrounding it. Here Dorling brings together brand new material alongside a carefully curated selection of his most recent writing on inequality from publications as wide ranging as the Daily Telegraph, the Guardian, New Statesman, Financial Times and the China People’s Daily. Covering key inequality issues including politics, housing, education and health, he explores whether we have now reached ‘peak inequality’. He concludes, crucially, by predicting what the future holds for Britain, as attempts are made to defuse the ticking time bomb while we simultaneously try to negotiate Brexit and react to the wider international situation of a world of people demanding to become more equal. Although economic inequality provokes widespread disquiet, its supposed necessity is rarely questioned. At best, a basic level of inequality is seen as a necessary evil. At worst, it is seen as insufficient to encourage aspiration, hard work and investment – a refrain sometimes used to advocate ever greater inequality. In this original new book, Danny Dorling critically analyses historical trends and contemporary assumptions in order to question the idea that inequality is an inevitability. What if, he asks, widespread economic inequality is actually just a passing phase, a feature of the capitalist transition from a settled rural way of life to our next highly urban steady-state? Is it really likely that we face a Blade Runner-style dystopian future divided between a tiny elite and an impoverished mass? Dorling shows how, amongst much else, a stabilizing population, changing gender relations and rising access to education make a more egalitarian alternative to this nightmare vision not only preferable, but realistic. This bold contribution to one of the most significant debates of our time will be essential reading for anyone interested in our economic, social and political destiny. by Danny Dorling & Stuart Gietel-Basten. Today we are shaping our lives and our societies more than ever before. Globally, we have never had fewer children per adult: our population is about to stabilize, though we do not know when or at what number, or what will happen after that. It will be the result of billions of very private decisions influenced in turn by multiple events and policies, some more unpredictable than others. More people are moving further around the world than ever before: we too often see that as frightening, rather than as indicating greater freedom. Similarly, we too often lament greater ageing, rather than recognizing it as a tremendous human achievement with numerous benefits to which we must adapt. Demography comes to the fore most positively when we see that we have choices, when we understand variation and when we are not deterministic in our prescriptions. The study of demography has for too long been dominated by pessimism and inhuman simplistic accounting. As this fascinating and persuasive overview demonstrates, how we understand our demography needs to change again. Greater economic equality is beneficial to all people in all societies, both for the rich and the poor – and the rest. The Equality Effect is almost magical. In more equal countries, human beings are generally happier and healthier, there is less crime, more creativity and higher educational attainment. Danny Dorling delivers all evidence that is now so overwhelming that it should be changing politics and society all over the world. For the past four decades, many countries, including the US and the UK, have chosen the path to greater inequality on the assumption that there is no alternative. Yet even under globalisation, other nations continue to take a different road. The time will come when The Equality Effect will be as readily accepted as women voting or former colonies gaining independence – and it will come very soon. From one of the world’s top social scientists comes a compelling argument for public policy to prioritise equality, fully-evidenced with statistics and sprinkled with black and white illustrations. Most importantly, he demonstrates where greater equality is currently to be found, and how we can set The Equality Effect in motion everywhere. By Dimitris Ballas, Daniel Dorling and Benjamin Hennig. What does Brexit actually mean for the UK and what are the wider implications for Europe? Was the UK ‘leave’ vote actually symptomatic of broader issues within Europe such as population mobility and the rise of non-traditional parties? Written by leading international authors, this timely atlas explores Europe’s society, culture, economy, politics and environment using state of the art mapping techniques. With maps covering over 80 topics ranging from life expectancy, greenhouse gas emissions, GDP to Eurovision voting, The Human Atlas of Europe addresses fundamental questions around social cohesion and sustainable growth as Europe negotiates the UK’s exit while continuing through the economic crisis. Taken as a whole, the atlas shows how geographical and state boundaries only tell a partial story and that we still live in a far more cohesive Europe than we realise. by Danny Dorling and Bethan Thomas. How can very recent UK trends in the years 2011-2015 be understood in the context of detailed maps of social change in the 10 years between 2001 and 2011? This unique atlas, the third in a bestselling series, uses a wealth of up-to-the minute data sources alongside 2011 Census data. It shows national and local trends and provides analysis of the implications of these for future policy. Packed with at-a-glance data tracking the period from boom to bust and beyond to the new Conservative government of 2015, key features include the analysis of over 100,000 demographic statistics and the use of new cartographic projections and techniques, all laid out in an attractive and accessible format. Put together, this is the most accessible guide to social change over the past 15 years, and is essential reading for all those working in local authorities, health authorities, and statutory and voluntary organisations, as well as for researchers, students, policy makers, journalists and politicians interested in social geography, social policy, social justice and social change. This is the only social atlas of the 2011 Census that explains so much about how all of the UK is changing. by Carl Lee and Danny Dorling. Geography ranges from globalisation to equality, from sustainability to population growth, from climate change to changing technology – and the complex interactions between them all. Exploration is driven by our innate curiosity; cartography is older than writing. Channeling our twin urges to explore and understand, geographers uncover the hidden connections of human existence, from infant mortality in inner cities to the decision-makers who fly overhead in executive jets, from natural disasters to over-use of fossil fuels. The aim of this book is to inspire a better politics: one that will enable future generations to be happier. While its publication coincides with the 500th anniversary of Thomas More’s Utopia, its proposals are not a Utopian wish-list. They are, crucially, a set of policy suggestions that are already in place (or are being tested) elsewhere in Europe; proposals that address the issues that appear to matter most to people in the UK. In the five years since the first edition of Injustice there have been devastating increases in poverty, hunger and destitution in the UK. Globally, the richest 1% have never held a greater share of world wealth, while the share of most of the other 99% has fallen in the last five years, with more and more people in debt, especially the young. Economic inequalities will persist and continue to grow for as long as we tolerate the injustices which underpin them. This fully rewritten and updated edition revisits Dorling’s claim that Beveridge’s five social evils are being replaced by five new tenets of injustice: elitism is efficient; exclusion is necessary; prejudice is natural; greed is good and despair is inevitable. By showing these beliefs are unfounded, Dorling offers hope of a more equal society. We are living in the most remarkable and dangerous times. With every year that passes it is more evident that Injustice is essential reading for anyone concerned with social justice and wants to do something about it. Inequality is more than just economics. It is the culture that divides and makes social mobility impossible. Danny Dorling goes in pursuit of the latest research into how the lives and ideas of the 1 percent impact the remaining 99 percent; and the findings are shocking. Inequality in the UK is increasing; more and more people are driven toward the poverty line. The mere accident of being born outside the 1 percent will have a dramatic impact on the rest of your life: it will reduce your life expectancy, as well as educational and work prospects, and affect your mental health. by Dimitris Ballas, Danny Dorling, Benjamin Hennig. Many of us think of European countries as discreet entities—their own languages, cultures, food, and economies squarely contained within their national boundaries. But in fact Europe is at once a unified place and a sophisticatedly fragmented one, and national boundaries rarely reflect its social and economic realities. The social atlas of Europe is the first atlas to map Europe according to these realities, from the perspective of human geography rather than simply a political one. Using innovative full-color visualization methods, it reconsiders European identity through its many different facets: economy, culture, history, and human and physical geography, visualizing Europe and its people in a more fluid way, in some cases using maps without artificial national boundaries. It utilizes the latest available demographic, social, and economic data through state-of-the-art geographical information systems and new cartography techniques. Through these new visualizations, this highly illustrated book offers fresh perspectives on a range of topics, including social values, culture, education, employment, environmental footprints, health and well-being, and social inequalities and cohesion. It is a bold rethinking of Europe as we know it and will be of interest to anyone who wants to understand the continent in its truest form. Housing was at the heart of the financial collapse, and our economy is now precariously reliant on the housing market. This ground-breaking book, argues that housing is the defining issue of our times. Tracing how we got to our current crisis and how housing has come to reflect class and wealth in Britain, All That Is Solid shows that the solution to our problems – rising homelessness, a generation priced out of home ownership – is not, as is widely assumed, building more homes. Inequality, it argues, is what we really need to overcome. An in depth examination of the impact that a global population of 10 billion will have on the planet and how we will have to adapt to cope with it. Before May 2011 the top demographics experts of the United Nations had suggested that world population would peak at 9.1 billion in 2100, and then fall to 8.5 billion people by 2150. In contrast, the 2011 revision suggested that 9.1 billion would be achieved much earlier, maybe by 2050 or before, and by 2100 there would be 10.1 billion of us. What’s more, they implied that global human population might still be slightly rising in our total numbers a century from now. So what shall we do? Are there too many people on the planet? Is this the end of life as we know it? This book describes the current extent of inequalities in health as the scandal of our times. It provides nine new chapters and updates a wide selection of Danny’s writings on health, including international-peer reviewed studies, annotated lectures, newspaper articles, and interview transcripts, to create an accessible collection that is both contemporary and authoritative. As a whole the book shows conclusively that inequalities in health are the scandal of our times in the most unequal of rich nations and calls for immediate action to reduce these inequalities in the near future. Telling the stories of the people who live along the 32 stops of the Central Line, this book illustrates the extent and impact of inequality in Britain today – part of a series of twelve books tied to the twelve lines of the London Underground. Like the trace of a heartbeat on a cardiac monitor, the Central Line slowly falls south through west London, rises gently through the centre and then flicks up north through the east end of the capital. At the start of the journey life expectancy falls by two months a minute. Between the first four stations every second spent moving on the train is exactly a day off their lives in terms of how long people living beside the tracks can expect to live. The Population of the UK explains how geography – in the widest sense – makes a difference to life outcomes. It explains the geographical differences in key socio-economic variables – like education, health, and work – that illustrate the UK’s stark social inequalities and affect everyone’s lives. The Visualization of Spatial Social Structure introduces the reader to new ways of thinking about how to look at social statistics, particularly those about people in places. The author presents a unique combination of statistical focus and understanding of social structures and innovations in visualization, describing the rationale for, and development of, a new way of visualizing information in geographical research. These methods are illustrated through extensive full colour graphics; revealing mistakes, techniques and discoveries which present a picture of a changing political and social geography. Equality is the coming issue of our day. Societies all over the world are experiencing spiralling inequality, led by countries such as the US and Britain, which reached their high-water mark of equality in the 1970s, only to head firmly and swiftly in the opposite direction ever since. They relaxed the controls over corporations and high finance, allowing the rich to become super-rich without caring about their impact on the poor or the planet – and ultimately plunged the whole world into economic crisis. But it does not have to be that way. Danny Dorling’s landmark book explains why greater equality is good for us all – even for the rich. It backs up its arguments with solid statistical evidence. It points out the countries that have mapped out an alternative, bucking the trend towards inequality and market mayhem. And it proposes some key ways in which we can restore the levels of greater equality that would sustain us all. This accessible reader brings together a selection of highly influential writings by Danny Dorling which look at inequality and social justice, why they matter and what they are. Encompassing an extensive range of print and online media – including newspaper articles and key publications – ‘Fair Play’ provides evidence that Britain is becoming more politically, socially and economically divided whilst coming together in terms of educational outcomes and reduced segregation by ethnicity. by Bethan Thomas and Daniel Dorling. We don’t live in the country we thought we lived in anymore; it has changed because we have changed. When it comes to immigration, the population explosion, the collapse of the family, the north-south divide, or the death of the countryside, common wisdom tells us that we are in trouble; however, this is far from the truth. In this anatomy of contemporary Britain, Danny Dorling dissects the nation and reveals unexpected truths about the way we live today, contrary to what you might read in the news. Exploring the key issues that make the headlines, this book will change the way you think about the country and explain just why you should feel positive about the future. Few would dispute that we live in an unequal and unjust world, but what causes this inequality to persist? As the five social evils identified by Beveridge are gradually being eradicated, this book claims they are being replaced by five new tenets of injustice, viz: elitism is efficient; exclusion is necessary; prejudice is natural; greed is good; and despair is inevitable. by Mary Shaw, Bethan Thomas, George Davey Smith and Daniel Dorling. An atlas of mortality in Britain based on data from 1981 to 2003, this new study explores causes of death across the UK, including a description of the cause of death, a map and cartogram showing the spatial distribution of that cause, a commentary on the pattern observed and the reason for it. Daniel Dorling, Mark Newman and Anna Barford. 366 digitally modified maps – known as cartograms – depict the areas and countries of the world not by their physical size, but by their demographic importance on a vast range of subjects ranging from population, health, wealth and occupation to how many toys we import and who’s eating their vegetables. Thomas, B. and Dorling, D. 2007, Bristol: Policy Press. Identity in Britain explores our changing identities as we progress from infancy to old age and tells the story of the myriad geographies of life in Britain. Features and benefits include: detailed maps and analysis of the contemporary neighbourhood geographies of people in Britain at various life stages; clear introduction and how-to-use guide making the atlas highly accessible for a wide range of users; and, accompanying bookmark to aid interpretation of the maps on each page. Dorling, D., Rigby, J., Wheeler, B., Ballas, D., Thomas, B., Fahmy, E., Gordon, D., and Lupton, R. (2007) , Bristol: Policy Press. This study of how poverty and wealth are geographically distributed in Britain covers the past 30 to 40 years. The relationship between wealth and place is little understood, and establishing the geographical distribution of wealth is essential for a more thorough understanding of social inequalities. Census and survey data have been used to construct consistent small area measures of both wealth and poverty at points in time across the last four decades. The authors have developed four consistent measures of poor and wealthy households. Danny Dorling, Janet Ford, Alan Holmans, Cathy Sharp, Bethan Thomas and Steve Wilcox (2005) London: Shelter. This book reveals that spiralling housing inequality is at the core of the housing crisis. It explores the damaging effects of this widening gap, particularly on children, and examines how housing inequality impacts on all other aspects of life for those worst affected. Written by leading academics, The great divide shows how this growing inequality, left unchecked, will polarise the nation, creating dire consequences for future generations if current housing policies are not urgently reviewed. Presents a critique of conventional criminological approaches to social issues claiming that the narrow focus on particular categories of crime deflects attention from other more socially damaging harms. And that the increasing dependence upon the criminal justice system to address the visible symptoms of society’s ills obscures our understanding of the potential social and economic remedies to those ills. Danny contributed the chapter showing that people living in the poorest parts of the country are at least five times more likely to be murdered than those living in the wealthiest areas, arguing that this stark facet of inequality can be traced back to the economic and social policies implemented in the early 1980s. The Policy Press September 2005. This lively, colourful and innovative pack has been designed specifically for use as a teaching aid and learning resource for students of geography, sociology, social policy and related social science disciplines. With new evidence about the nature of social and geographical divisions in British society, it is also an invaluable resource for policy makers and local authority professionals in areas such as planning, education, housing, poverty and social exclusion. The topics selected are central to themes covered both at undergraduate and A-level and focus on the differences between areas within the UK, highlighting the spatial inequalities and gaps in service provision that the census data have revealed. Cartography by Graham Allsopp, published by Sage March 2005. 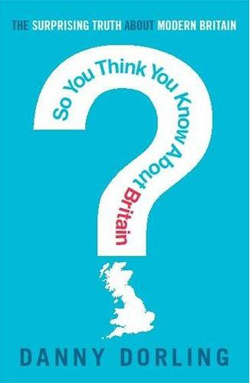 The book is a short introduction to life in the UK as described from the point of view of a young person’s life chances given their area of upbringing. Using statistics from many different datasets and specially drawn ‘opportunity surface’ maps throughout, the book describes the social landscape of the United Kingdom in an engaging and accessible way. It is written from the perspective of a beginning undergraduate, and a website is being provided to accompany the book at http://www.dannydorling.org/books/hguk. The website includes over 100 full colour illustrations and all the data and analysis spreadsheets used to inform the arguments made in the book. Simulating the local impacts of national social policies, published by the Joseph Rowntree Foundation in early 2005, written by Dimitris Ballas, Dave Rossiter, Bethan Thomas, Graham Clarke and Danny Dorling. This report presents possibilities of creating a simulation model that can be used for the estimation of the spatial impacts of social policies, as well as their socio-economic impact. The report builds on past work in the area of microsimulation to present a new spatial simulation methodology including the dynamic simulation of household spaces as an alternative to household simulation. Microsimulation has been widely used by governments around the world for the analysis of redistributive policies and budget changes. Nevertheless, the report argues that there have been very few examples of extending these simulation models to enable the estimation of geographical impacts of policies. Written with Bethan Thomas and published in 2004 by Policy Press. The book contains several hundred maps of 2001 census data almost all for all of the UK and almost all also compare the social shape of the country in 2001 to the situation in 1991. Commentary and analysis is included and an appendix giving estimates of the changing proportions of the population in each area who are wealthy, poor, or have a high income. Cartograms and conventional maps are used throughout and in full colour at the local authority district and council area level. 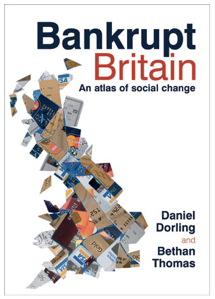 Danny Dorling is co-author of ths book written mainly by Ron Johnston, with Charles Pattie and David Rossiter. The book explains how the British electoral system treats parties disproportionately and differentially. An original study of the fourteen general elections held between 1950 and 1997 shows that the amount of bias in those election results increased substantially over the period, benefiting Labour at the expense of the Conservatives. Labour’s advantage peaked at the 1997 general election when, even assuming there had been an equal share of the votes for the two parties, it would have won 82 more seats than its opponents. Written with Mary Shaw and Richard Mitchell and published in 2002 by Pearson. The book introduces students of geography, sociology and health sciences to the key factors connecting health, place and society. It uses recent research findings and places them in an historical context in an attempt to provide a brief and accessible introduction to medical sociology and health geography. The book suggests further reading, film watching and internet surfing to encourage the reader to explore this rapidly expanding research field. It is now freely available as a PDF file. Edited by George Davey Smith, Danny Dorling and Mary Shaw and published by the Policy Press in 2001. This book presents excerpts from a very large number of original sources detailing the continued discovery and rediscovery of the inextriable links between poverty inequality and health in Britain over the course of the last two centuries. The book includes a timeline of major events related to these issues and an introduction from the editors. The book begins with the case made against slavery, moves through decades of advocacy for social and political reform in Britain and demonstrates how, through the power of argument, improvements in health are achieved. Inequalities in Life and Death: What If Britain Were More Equal? The book looks at the role played by age, gender, social class and unemployment in producing geographical differences in mortality. It reports on research explaining the extent and changes in social injustice throughout the 1980s and 1990s and highlights dramatic findings, clearly portrayed with extensive use of full-colour maps and graphs. The book also presents the results of modelling exercises which show what the effect on mortality would be – in terms of actual number of lives saved – if full employment were achieved, child poverty were eradicated and material inequalities were reduced. Edited collection of seventeen chapters published by policy press in 1999. Edited by David Gordon, Mary Shaw, Daniel Dorling and George Davey Smith, with an introduction by Peter Townsend. The book reports the evidence presented to the Acheson Inquiry which was labelled as the most important government-backed examination into inequalities in health in the past 20 years. However, much of the detailed evidence presented to the Inquiry was not published. This book presents all seventeen chapters of evidence commissioned by the Acheson Inquiry to inform their work. It complements the Acheson Inquiry report published by The Stationery Office. Written with Mary Shaw, David Gordon and George Davey Smith and first published in 1999 by Policy Press. The back cover quotes: “When Tony Blair tours the North to show the wide variations within regions as well as between them, and when Alan Milburn declares commitment to tackling inequalities in heart disease as part of making a fairer society generally, then you know something has touched a chord. It is rare for an academic work to have such an effect on media and ministers, but the widening gap has done just this”. John Nicholson, Chief Executive, UK Public Health Association. A collection of 47 papers edited by Danny Dorling and Stephen Simpson, published in 1999 by Arnold, reprinted in 2000 (and in Japanese in 2003). The claim of the book is that statistics are pervasive and powerful, but often misleading or misunderstood, no more so than when they concern society. The book presents a series of case studies are presented with the goal of showing specifically how statistics are used throughout society. It demystifies statistical reports and helps the reader become a more critical consumer of statistics and a more skilled user of statistical methods. Written with David Fairbairn and published by Longman in 1997 this book illustrates how maps tell us as much about the people and the powers which create them, as about the places they show. The book presents historical and contemporary evidence of how the human urge to understand & control the world is presented through the medium of mapping, together with the individual and environmental constraints on the creator of the map. This book provides an introduction to the concept of cartograms, the various methods of creating them, and some common applications. It contains a large number of colour figures to visually demonstrate the power of cartograms, drawn from many different sources. Champion, T., Wong, C., Rooke, A., Dorling, D., Coombes, M. and Brunsdon, B.
Oxford: Oxford University Press, 1996. This atlas 1990s sources, notably the 1991 Population Census, to provide a picture, and to document the principal developments in the distribution, characteristics, and circumstances of the British population. The primary focus is on those aspects which changed most in the early 1990s and/or constitute key issues for policy-makers. Published by John Wiley in 1995 it features over 100 double-page spreads of detailed maps and cartograms depicting the geographical distributions of many facets of society in the 1990s as revealed by Britain’s censuses and other sources.